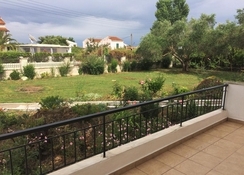 Surrounded by olive trees and located on a lovely beachfront in Kavos, Captains Studios & Apartments is a family friendly luxury apartment just 50m from the beach. Featuring a pool, terrace and snack bar this hotel provides magnificent views of the Ionian Sea and the garden and provides an excellent choice of accommodation for the young adults, families and groups of friends. Elegant, well-appointed comfortable rooms welcome guests to rest in comfort and are equipped with kitchen, refrigerator, home appliances, air-conditioning, safe box and a balcony on both sides. The hotel, serving guests since 1979, gives the guests a feel of home while being away from home. Kavos is perhaps the most popular and active beach located approximately 50 km south of Corfu Town. The large sandy beach has plenty of tourist facilities like umbrellas and sundecks and preferred by families with small children due to the crystal clear shallow waters. Many beach bars, snack bars, hotels and shops surround the area and at night the nightlife on beachfront goes on till the wee hours. 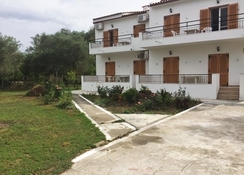 Captains Studios & Apartments is surrounded by olive trees and located on a lovely beachfront in Kavos. The centre of Kavos at in St. Peter’s with shops and restaurants is barely 800m away. The Lefkimi Port is within 3km. 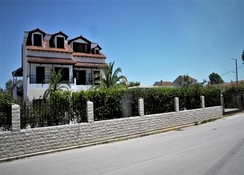 The property is 45km from Corfu Town and 30km from the Corfu International Airport. Elegant, well-appointed studios and guest rooms that are simple yet comfortable welcome guests to rest in comfort and are equipped with kitchen, refrigerator, home appliances, air-conditioning, safe and box. These come with balconies in the front and back providing amazing views of the Ionian Sea and the surrounding gardens. All apartments at Captains Studios & Apartments come with a fully-equipped kitchen with refrigerator to enable guests to cook their own food. There is a snack bar that serves a wide range of light bites and meals along with exotic cocktails. Special diet menu is available on request. The bar where guests can enjoy with a relaxing cocktail also functions as a reception area where sports events are screened on the satellite TV. Captains Studios & Apartments has a swimming pool and terrace besides access to the private beach. There is a beauty and barber shop and massage service available on request. Tiny tots can have fun at Kid’s Club or Playground. The hotel has facilities for Bicycle Rentals and Movie Nights. The hotel can arrange snorkeling and skiing on request.